There have been some really cool updates to Planhat in March. We have made updates to the churn module, it's now easier to merge end users, improved NRR reporting on the company profile charts, and more. So check them out below! If customers churn you need to know the reasons why, and you need to be tracking them so that your team (and the entire company) can analyze them to improve product and strategy. The churn module can help your team know where you need to adjust and improve. 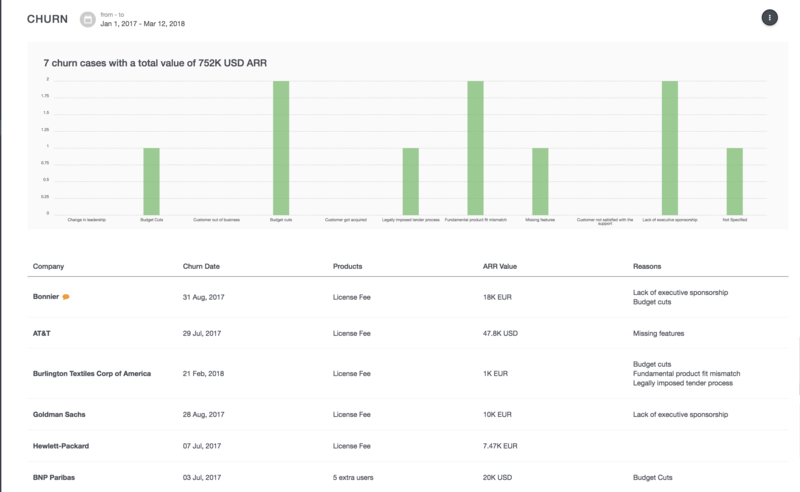 We have added additional charts so you are able to get a quick analytical overview, and a better overview of the reasons for churn that have been gathered in the survey. We have also updated the way you log a customer as churned. To do so, you go to the menu in the top right corner on the customer profile, and at the bottom of the list you will see "Log Churn." To learn more about the updates and see them in action, check out this article and video. If your customers have multiple offices around the world, if they're split into separated divisions, or if for any other reason you need a "group structure" then you can use Planhat's org-structure functionality to organize your customers into a tree structure. Now you have the ability to view or not view tasks, activity data, revenue data, or contact data on the parent company profile. Check out the GIFs below to see how it works. You can learn more about Planhat's group structure feature here. We have improved the stats you see associated with the user by adding a chart similar to the one on the company profile, as well as the view of the activity data for each user. Sometimes a user is in Planhat 2x (for example if one user is associated with multiple companies). If you would no longer like to have 2 separate profiles for this user, Planhat lets you merge those two profiles without losing any data. Check out how you can do that in this help center article. See how much of your monthly revenue comes from NRR (Non-Recurring Revenue) in the revenue charts in the Customer 360 view. If there is an NRR item it will appear as a yellow bar on top of the dark blue ones that represent the recurring revenue for each month. The revenue module settings has moved from being in the revenue module, to now being a part of the general account settings. And here is where you will find your revenue settings.